Chai- N- Chaat 2011 held its day-long community-based cultural event and fundraiser to raise funds and awareness of Austin’s diverse ethnic populations as well as four local Austin nonprofits, Saheli, Interfaith Action of Central Texas (iACT), LifeWorks, and Eastside Community Connections (ECC) at the Community Renaissance Market, a locally owned micro-business location with tenants ranging from antiques, organic dog treats, and fair trade jewelry. The experience was led by the day’s vocal entertainers Sahana Roy with harmonium Sameer Kothasthane, Austin College of Indian Music’s very own Saitej lyer and Neel HomChowdhurry, and a spiritual song by Brian Lottman. The audience watched as dancing talents Varsha Bankapure-Jawadekar performed a North Indian classical dance form and little divas showcased Indian culture with fold and classical dances from Sargam Dance School. 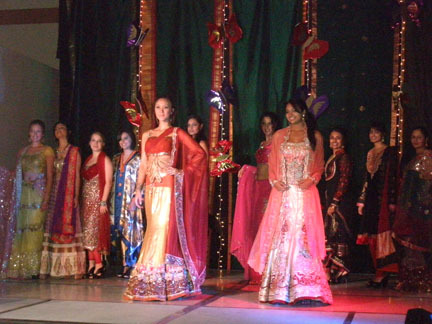 The Fashion show was beautifully organized by modeling instructor and cultural director, Sunny Filut with spectacular designs via wonderfully elaborate colors from Ruby Bhandari-Silk Threads. The day was complimented by a variety of vendors that were present including apparel from Bollywood Collections and Designs by Sidra, anti-aging herbal products by Life Vantage, and Sagar Collections by Indian Embroidered & Gifts. We Flap, a local social non-profit enterprise that is aimed at creating a vibrant community that enables individuals to engage with and assist various non-governmental organizations around the World was the event coordinator. Representatives from Saheli, organization that provides assistance to Asian families dealing with domestic violence and abuse by improving their access to services and increases community awareness of various forms of violence and oppression, iACT, group that cultivates peace and respect through interfaith dialogue, service and celebration, LifeWorks, nonprofit that transitions youth and families from crisis to safety and success through their 9 service locations and 17 programs, and ECC, a University of Texas student-run nonprofit that offers food pantry services and adult education programs to lower-income residents of East Austin were present to spread knowledge of their mission.